Q From Ally McConnell: "Can you please name the Ayr United player who holds the British League Goalscoring record achieved in season 1927-28 which was the same season Dixie Dean was scoring 60 goals in England?" A This was Jimmy Smith who scored 66 league goals for Ayr United that season. Counting friendlies he scored 84 in all in 50 matches. Previously with Dumbarton Harp, Clydebank and Rangers (for whom he played just two League games), Smith later went on to play for Liverpool, Tunbridge Wells Rangers, Bristol Rovers, Newport County, Notts County and Dumbarton. There is a misconception that he was a flop in England yet he scored 38 league goals for Liverpool in 61 matches. In his two seasons at Anfield he was top scorer one season and 2nd best the next. Q John Owen writes: "After my earlier query about Morton's record of consecutive league wins, I am asking about East Stirling's run of losses. What is the record for consecutive league defeats, and are East Stirling anywhere near beating the record?" Q Craig Kerr asks: "The McGrory versus McCoist debate has been raised again and no work is getting done! Can you please list their various attributes / scoring feats to allow for a comparison?" A Youll never settle it. I suspect followers of one team will always favour their man over the other no matter how much evidence is produced to the contrary! Briefly, Jimmy McGrory scored more League goals than anyone else in Scottish football. Ally McCoist has scored more than anyone else in post-war Scottish football. McCoist is credited as being top scorer in Europe twice. McGrory was also top scorer in Europe twice. McCoist has scored more goals in Old Firm fixtures than any other player. McGrory scored more goals in the Scottish Cup than any other player. McCoist won far more Scotland caps than McGrory. McGrory scored far more goals in a season than McCoist. Q Michael Brown's query is: "Can you name the last all-Scottish team to win the Scottish Cup?" A It was May 16th 1987 and the team in question was St Mirren who fielded 13 Scots (including substitutes) thus: Money, Wilson, Winnie, Cooper, D Hamilton, B Hamilton, Abercromby, Lambert (Fitzpatrick), I Ferguson, McDowall (Cameron), McGarvey. They defeated Dundee United 1-0 thanks to a goal from Iain Ferguson nine minutes from the end of extra time. Q Ger Harley asks: "How many times has a Scottish side won a European tie on away goals?" A Scottish teams have won just five times on away goals. Rangers v Sporting Lisbon CWC 71-72, Dundee United v Anderlecht UEFA Cup 79-80, Dundee United again v Rapid Vienna European Cup 83-84, then twice last season - Livingston v Vaduz and Celtic v Celta Vigo both in the UEFA Cup. A rather poor record, seeing as our clubs have lost by this method on 25 occasions! Q Mike Donaldson wonders: "Have Celtic broken every record going this season?" A No they haven't. There's a popular misconception among Celtic supporters that their recent unbeaten run has seen every record in the book tumble to the Bhoys but it just isn't so. Yes, they have set some new and remarkable records. At the time of writing (March 2004) they have set new records for the most consecutive victories in the top flight, the most consecutive victories in a single season in Scotland and the longest unbeaten home run of any Scottish side. BUT...... by drawing with Motherwell on March 14th their winning streak ended at 25 in succession - exactly the same as Morton managed between April 1963 and February 1964. The longest unbeaten League run ever is 62 games between 1915-17 - a record held by Celtic themselves and one they are only just over halfway towards reaching. In Europe they have now played 18 games since their last home defeat - against Ajax. But from March 1969 when they lost to AC Milan to December 1983 when Nottingham Forest triumphed, Celtic played 34 home games in Europe without loss. Admittedly, three of those matches were at Hampden but they still count. And in what will probably be a vain attempt to stop the Bhoys heads from swelling even bigger, I can confirm that six consecutive away defeats in the Champions League is also a new, if unwanted, record! Q John Scott wants us to list " the top ten all time goal scorers for Glasgow Celtic F.C." Q From Alan McCabe: "Any info on Shawfield Amateurs who played in Scottish Qualifying Cup matches until the mid-1960s? Were they related to Clyde? And any idea of where they played?" A Shawfield Amateurs first came to prominence in the 1930s. They won the Scottish Amateur Leagues Third Division in 1936 and the Second Division in 1937. They didnt take part in the Scottish Qualifying Cup until after the Second World War and their first tie was a 9-1 away defeat at East Stirling. In 1948 they reached the last four of the short-lived Midland qualifying section and qualified for the Scottish Cup proper. It wasnt a great experience as they were beaten 8-0 by St Mirren at Love Street. From 1948-49 onwards they competed in the South Qualifying Cup though without success. From 1954-57 the Qualifying Cups were in abeyance and all teams competed in the Scottish Cup proper even though it was still in effect a qualifying competition. First Division clubs didnt enter till round five. In these seasons Shawfield were beaten in the first round by Babcock& Wilcox in 1955 and Elgin City in 1957. But in 1956 they beat Murrayfield Amateurs after a replay before losing to Gala Fairydean. Thye continued to compete in the re-founded South Qualifying Cup until 1963-64. A 4-0 defeat at Wigtown was their last cup tie. It was noted at the 1964 AGM of the SFA that they were no longer members of the association though no reason for their disbandment was given. As far as I am aware there was no link with Clyde. Nor with the also now defunct Shawfield Juniors who were one of the top sides around in the late 1930s and the immediate post-war period. Nothing on their ground at the moment I'm afraid but I'm sure if anyone out there has any information they'll get in touch. Q 'Islandbear' wants two questions answered. Firstly: "Who was the first player to score a hat trick in Scottish football?" 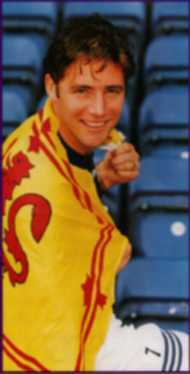 A John Kytie MacPherson was first to register a hat-trick. In fact he went one better, scoring four for Rangers in a 6-2 win at Cambuslang on Aug 23rd 1890. Q "Who is the top scorer in Old Firm games?" is the second query. A In League games its Ally McCoist with 17 for Rangers. Top Celt is Sandy McMahon with 15. Overall, counting Scottish Cup and League Cup its McCoist with 24 and McMahon 19.